This is no mistake! 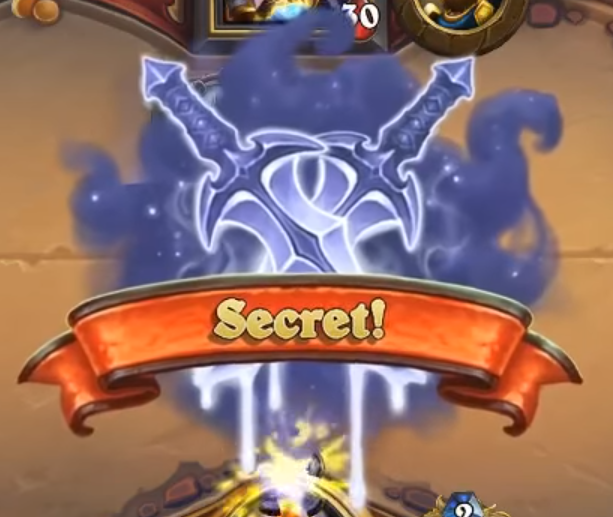 Rogues are getting Secrets in Kobolds and Catacombs! We won't see Rogue secrets in the expansion following Kobolds, but they may occur again in the future. Join the discussion on our forums! Come discuss Sudden Betrayal over in our dedicated Sudden Betrayal discussion topic. We shall rule this land, and we shall call it 'Visland'. Terrible! Simply terrible! How did they DARE not make the flavour text "It was inevitable, curse it!" That flavor-text came dangerously close to a Jojoke... Dodged a bullet there. Rogue now has 5 cards that mitigate face damage! Leeching Poison, Shadowblade, Valeera the Hollow, Evasion, and this! This card is so underrated. It's a rogue card that save your FACE DAMAGE , there are no any other rogue class card has this kind of effect. This card will definitely see play. 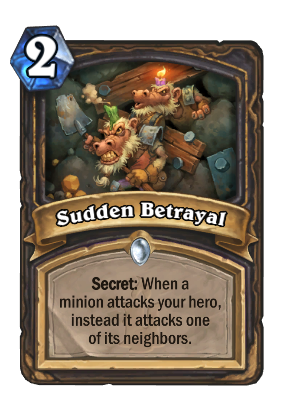 Betrayal is now a secret, because nobody played it as a regular card. Definitely see the value in this card and i'm glad sneaky rogues are getting secrets. For rogue combo decks, this helps you live. It even works in aggro decks too, but is somewhat easy to play around. If rogue puts down a drop that you expect they'll want to bounce and then places a secret, you'll guess that it's cheat death and go for face instead. If it's this, then oops. I can see how with just those two secrets you can make people guess wrong. Sneaky. It took them long enough for Rouge to have secrets. While the two secrets, Sudden Betrayal and Cheat Death don't sound much better than Betrayal or Shadowstep respectively, Rouges to me seem like the class that should've had them a long time ago. Misdirection for rogue. could be good if it finds a place. Anyone else dig the Secret Background as much as me? Between this and Crushing Walls I wonder how many more cards that involve minion placement are coming? In the amusement department, I can envision a Rogue vs Rogue matchup where one has this in play, and the other drops a Southsea Deckhand which calls Patches the Pirate and Patches ends up running into the deckhand. You know it will happen at least once. Rogue Secrets? Mill is gonna love this.